The folks at inXile, despite just releasing a massive Wasteland 2 update, otherwise known as Wasteland 2: Director’s Cut, and despite being in the middle of development of not one but two Kickstarter RPGs – Torment: Tides of Numenera and The Bard’s Tale – have filed a new trademark. Yesterday, RPG Codex spotted the filing made by inXile for Autoduel. If the name rings a bell, that’s because it’s the name of the Origin Systems vehicular RPG released 30 years ago, itself inspired by Car Wars, the Steve Jackson Games series. 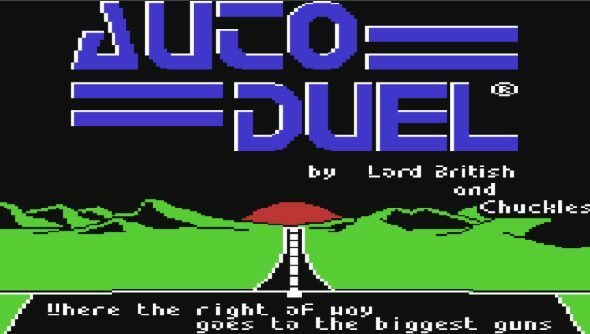 The original Autoduel pitted players against gang-infested stretches of highway in a dystopian future-America. A vehicle-battling RPG sounds like just the thing after being both entertained and a bit disappointed by Avalanche’s Mad Max. While nothing has been announced, Brian Fargo retweeted RPG Codex’s discovery suggesting that something is in the works.